TrendSource Trusted Insight, a market research and strategic consulting firm sought to understand the motivators behind brand loyalty for retail clients. 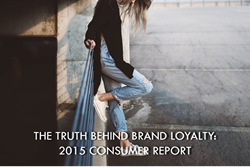 TrendSource surveyed over 4,000 consumers, gauged their understanding of brand loyalty, and found that millennials understand brand loyalty more than any other generation group (90%). In addition, study results showed that more than any other generation, Millennials selected value and price as a determining factor in their brand or store loyalty, suggesting that careless spending may not be the norm—an important insight as they quickly become the group with the largest spending power both locally and globally. For the complete breakdown of brand loyalty behaviors and motivators, click here to download the full report. TrendSource provides business intelligence, customer experience insight, compliance solutions, and other market research and data analysis programs that deliver measurable ROI. With over twenty years of experience, TrendSource’s customized solutions deliver high quality Customer Experience Management Programs that quantify service gaps, provide prescriptive/corrective solutions, identify trends, and provide actionable solutions through enhanced reporting and analysis. Methodology: TrendSource conducted this research study by surveying North American Field Agents in the MSI database between September 14th and October 4th, 2015. The results represent 4,019 online respondents who opted in to participate voluntarily. For more information about this study or TrendSource’s services email: TrustedInsight(at)trendsource(dot)com.